One of the most popular financial goals that I hear the most is the dream of wanting to buy a home or investment property…to have the choice and freedom to live in or to rent out. Something to look at, see, touch, admire and even style and decorate to your hearts content. But for most of us, it is one of the hardest financial goals to achieve and it can be painfully slow to save that initial deposit, necessary to lock that property purchase in and achieve that goal. I remember when I was saving up for my first deposit, it took 6 years. I was so enthusiastic and passionate but I was so frustrated as I watched and worked so hard to build my deposit. Even disheartening at times when I would realise how much longer it was going to take before I would have enough for my final deposit. Nonetheless, I persisted on, determined and focused, and when that moment came where I finally secured my first property, the feeling of joy, satisfaction and pride made it all worth it. My advice to anyone when it comes to buying a property is to do your research. Lots of research. Research whilst you are saving up for your deposit. Look at properties online, inspect them in person, ask questions, get to know the area, and of course, know your numbers. Buying a property is most likely going to be one of the biggest transactions that you will ever participate in and you want make sure that it is right for you, and right for your financial goals. Lendlease not only knows and understands these feelings and challenges when it comes to first home buyers saving that deposit and researching for the right property, but they have also completely revamped and recreated the first-time buyer experience. Lendlease’s First Place is a first home buyer initiative to help make buying your first home a reality sooner and more exciting, but also make you a more informed purchaser. Their offering is exclusive to first home buyers, looking to get their foot in the door of Melbourne’s property market. 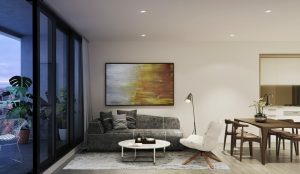 Lendlease’s First Place gives first home buyers the opportunity to pay only a 5% deposit on any Melbourne Quarter or Victoria Harbour apartment and Lendlease will amazingly match your 5% deposit. So that $70,000 deposit that you need to save up now only needs to be $35,000. This offering is for their No. 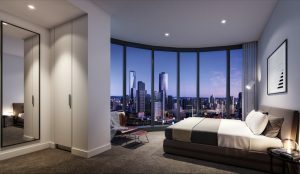 1 Collins Wharf and Melbourne Quarter’s East Tower off-the-plan apartments, as well as two new developments, 889 and 883 Collins Street, which are available to view now. But the First Place offering goes even further to help first time buyers…and as I said, making you a more “informed” buyer as well as more efficient. 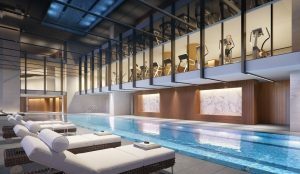 Lendlease actually allows you to “test drive” your property before you buy, so that you are 100% sure, by offering you the chance to stay rent free for one week in their fully furnished property at 883 Collins Street. That way you get to see what it feels like to live there, see the amenities, the community, and the neighbourhood before you make the big decision to buy your “First Place”. That researching responsibility has never been easier and let’s be honest, more fun. Plus on top of the matched 5% deposit, you may still qualify for the Victorian First Home Owners Grant of up to $10,000. Obviously always read the full terms and conditions, which you can read here. But this is certainly one great starting place if you are really serious about establishing yourself financially. And as we all know, many helping hands, especially when they are financial, makes the first and hardest challenge lighter and more enjoyable to achieve and succeed. I only wish this was available when I was saving for my deposit.